10 Ideas to Make Holiday Festivities Tastier – and Easier! As most people will tell you, as much as they want to enjoy holiday festivities, being responsible for entertaining or providing tasty treats at every turn can be a challenge! Willow Tree has come up with a number of ways to help you serve festive foods that have the look, freshness, and most-importantly taste, of home-made holiday goodness, even when you don’t have time to cook from scratch between all of your commitments. We also threw in a few gift ideas that are sure to be a pleasant surprise for friends, relatives, co-workers, and folks who provide you with valuable services through the year. 1. Serve a great Party Platter – A ready-made tray with a variety of delicious finger sandwiches can be a pretty impressive site to party guests (of any age) – not to mention how satisfying it is to be the one to serve it! Our retail store will be happy to make a variety of party platters, including cold-cuts, seafood, tuna, ham, egg, and chicken salad. Willow Tree chicken salad is available at your favorite deli or grocery store, if you’d like to build your own platter. One idea might be to add a few of your favorite mix-ins to our chicken salad as well as use different types of bread, or crackers, to make a very enticing platter. 2. 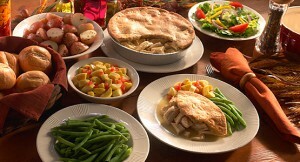 Chicken and Turkey pies – in different sizes for different occasions. The convenient thing about Willow Tree pies is that they come in different sizes. If you’re having a small group over for lunch, or even brunch, each guest can have their own personal pie. Larger sizes might be better for dinner parties – or for serving to your family when you are too wrapped up, no pun intended, in holiday preparations to cook. Turkey pies are available at our retail store, while chicken pies are at grocery stores throughout New England, and can be ordered online. Have you tried our new varieties yet – Red Bliss Potato and Classic Vegetable? 3. Gift cards – Give the gift of good taste this year! Our gift cards, which are redeemable at our Attleboro retail store, can be ordered online for your convenience. Download our retail store menu here so you can see what a gift card recipient can buy! 4. Coupons – Treat yourself to a discount. Join us on facebook.com and download a coupon, one per customer per campaign please! This will get you a discount when you buy Willow Tree chicken pies at your grocery store. 5. Recipe ideas – side dishes can make all the difference! Whether you’d like to add a little zing to traditional chicken salad finger sandwiches on your party platter, or serve your poultry pies with something extra special on the side, we have some recipe ideas for you. Our gravies are available at the Willow Tree Retail Store and now in select grocery stores throughout New England. Willow Tree sells fresh turkey for the holidays! 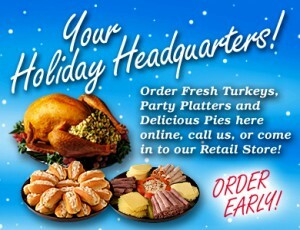 Click here to order your fresh turkey and dessert pies! 7. Dessert pies YUM! – Did you know that our retail store carries high-quality, 10” dessert pies for the holidays? Call ahead and see what kind we have ready for you – apple, coconut custard, plain custard, strawberry rhubarb, and others. A great way to top off any holiday feast. 8. Save time with online orders. Not only can you order many of your favorite Willow Tree items online, but we ship throughout the US and internationally. Willow Tree fans who have relocated write in to tell us this is a great way to keep Willow Tree with them across the miles! Do you know a fan who can’t pop into the retail store, or find us in their grocery store? This option may make a great gift to them, while saving your shopping time. 9. Visit our retail store – for Attleboro area shoppers. Located along side our production plant in Attleboro, Massachusetts, Willow Tree Farm’s retail store has served the local community for over 60 years. On your way to a holiday party, or hosting one of your own? 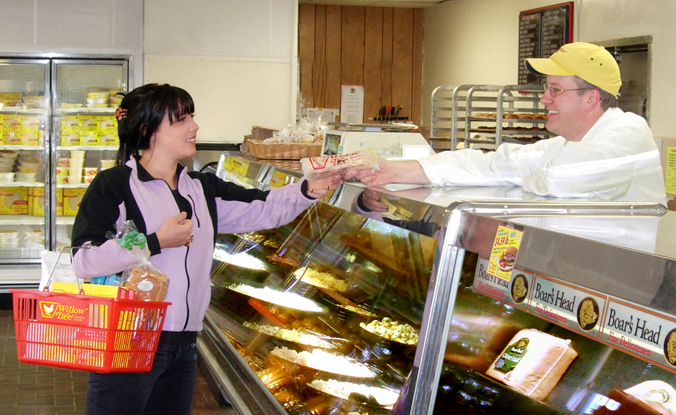 Stop by our full deli with cold salads, cold cuts, fresh poultry, hot food items, fresh baked pies, milk, eggs, grocery items, chips and soda. Store hours are 8am to 6pm seven days a week. 10. Give aways and prizes to reward you through the month. In December we’ll be rewarding our loyal fans who follow us on facebook and Twitter with chances to win family packs of P-Bruins tickets, free 26oz pies, and other great prizes like a winter supply of Willow Tree Premium Chicken Pie! Did you know that you can enter our “How do you Willow Tree?” contest multiple times, as long as you submit a different idea of how you like to enjoy your Willow Tree Chicken salad each time. We hope we’ve given you a few ideas for how to easily prepare for a tasty holiday season, minus much of the stress that can go along with it! Great to know that you also have dessert pies! I am seeing a strawberry rhubarb pie at my holiday celebration!